It’s harvest time and a semi full of corn just pulled onto the scales at Seven Springs Farm in Cadiz, Kentucky. On the scale, the analytics work begins: moisture content, weight, production rates, and more are all recorded. This is just one truck and many more will follow with much more to be stored and later sold for ethanol production. Just one of the farm’s bins can hold as many as 350,000 bushels, or 16.8 million pounds. These trucks of corn are just one bite of a mouthful of big data that this local farm’s server can no longer swallow. As the farm’s production and technology manager, it’s Nick Woodruff’s job to keep track of it all. “The way things communicate now and interact has changed a lot in the last couple years,” Woodruff said. Nick Woodruff manages production and technology at Seven Springs Farm in Cadiz, Kentucky. So has the size of the farm: what started at just 2000 acres covers 36,000 today. When the farm was smaller and “clouds” still just meant white puffy things in the sky, farm data were stored on site. Now, everything is transmitted to a cloud server owned by John Deere, the tractor company. “All the technology we use is to make us better,” Woodruff said. The farm uses drones for aerial imagery, “so we can see our strengths and weaknesses at any time in the field,” he said. Machinery and software orchestrate the farm’s variable rate planning, a process that automates the rates of chemical application and seed planting based on detailed field maps. Woodruff can watch this happen in real time and receive the data as it happens. “It’s all to cut cost, increase production and be more efficient,” he said. Big data brings big opportunities. Advanced precision technology allows farmers to crunch massive amounts of data collected through sensors that suggests seeds to use, optimal planting strategies to improve production, cut operational costs, and minimize environmental impact. But as data add value, some thorny questions crop up: just who owns the data? Woodruff has a privacy agreement with John Deere that makes him owner of data he adds to the company’s database. However, a company with no connection to Woodruff, Ag Connections, also has access to that information once John Deere adds the data to that collected from other farmers. Rick Murdock and Pete Clark are co-founders of Ag Connections. 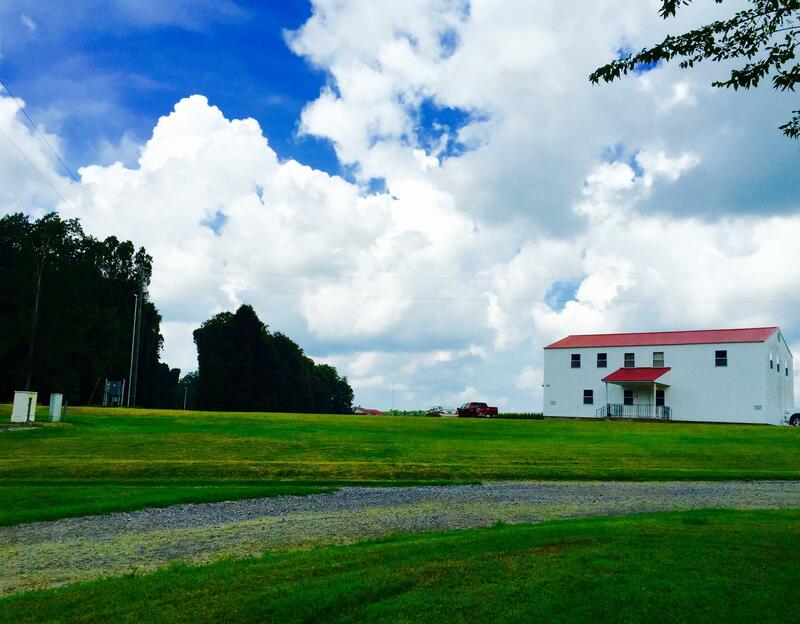 Clouds loom large–both literally and figuratively–over Ag Connections, a high tech company housed in an old tobacco barn in Murray, Kentucky. The company has integration agreements with John Deere and other manufacturers. Ag Connections is housed in an old refurbished tobacco barn in Murray, Kentucky, and was recently purchased by Syngenta, which is currently the world’s largest seller of agricultural chemicals. (There are talks that China National Chemical Corp. might also be buying Syngenta.) Ag Connections software is offered as a service with Syngenta’s products. 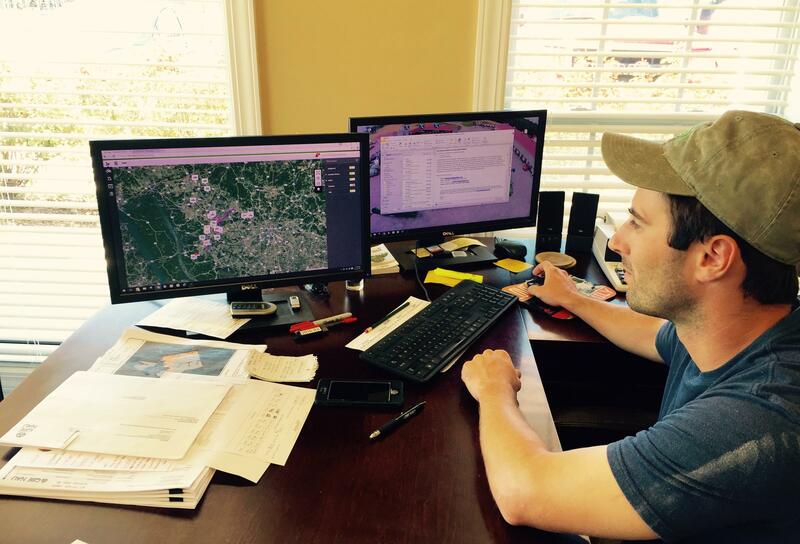 Murdock and Clark realized the value of data back in the 90’s when they saw farmers doing detailed spatial analytics. The farmers knew how to get data, but didn’t exactly know how to manage it. “What we wanted to do was give them a software product where if they kept their records they could more professionally report and relate to their business partners,” said Murdock. The software also helps clients comply with regulations. A weather app, for example, will allow a grower to make fertilizer purchase orders with the forecast in mind. That can help reduce pollution from runoff. “In northwest Ohio we have a lot of growers where they aren’t allowed to apply nitrogen on the field if there is a forecast in the next 36 hours with one inch of rain or greater,” Murdock said. Increased government regulations are expected across the board. Murdock says their software can help a grower document due diligence. By looking at data from a grower’s current performance and comparing that to state and national averages, the company can also assess how efficiently they are using fertilizer. “That relates to food processors who want to document that it’s being done under sustainable methods,” Clark said. This baseline allows grower to promote their products as “sustainably sourced” for the products that went into growing the food. Clark said Ag Connections understands growers are concerned about their data. So the company has a privacy agreement with each client. As the security concerns continue to mount, the Farm Bureau suggests a list of data principles be adopted by each agriculture technology provider. Ag Connections signed on to this as well. 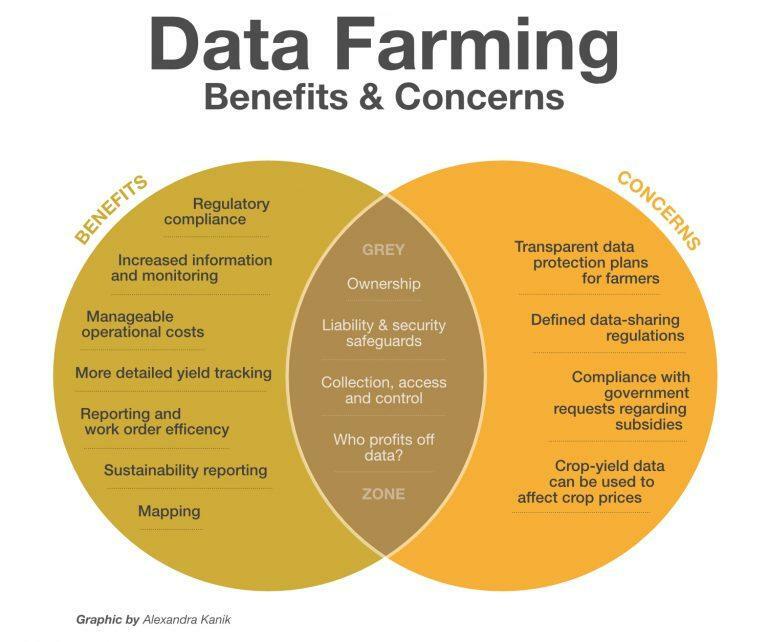 The more data harvesting grows, so do concerns in farm country. 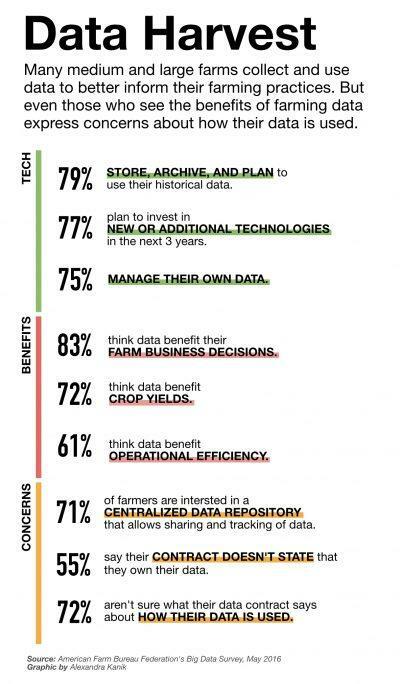 According to a May survey by the American Farm Bureau Federation, 77 percent of farmers are extremely concerned about who gets access to their data. “There is a lot of fear currently and a lot of the fear is real,” said Terry Griffin, a cropping systems economist at Kansas State University. Griffin and some colleagues are working on a white paper on big data in agriculture. Griffin worries about threats from hackers planting false data. But most farmers he hears from are worried about who owns data and how that might affect the value of farm land. Griffin said loss of data control could undermine a grower’s competitive advantage and could even lead to land grabs. “Farms may fear that a neighboring farm may have a better competitive advantage than they do and acquire more land more quickly,” Griffin said. Simple land transactions could quickly become complex. For example, if land is rented, as many farms are, who then owns the data generated: the tenant or the landowner? “Absent a privacy agreement or some other sort of contract negotiated between the parties there may not be a whole lot of protectable rights with respect to that information,” said Oklahoma State University Associate Professor Shannon Ferrell, who is also working on the white paper. Law protecting trade secrets might apply, but Ferrell said that would take some work. There is probably a good argument to be made that the producer owns any raw data that they are collecting. But much of the law surrounding intellectual property rights, such as copyrights and patents, hinges on the creative effort behind a piece of information. There is nothing “creative” about, say, the yield monitor data from a grower’s combine. That means the grower probably can’t copyright or patent the information. “If someone takes that information–just raw information–but creates something new out of it, that creator probably has a greater right to the new creation, whether or not they would have any claim to the data that got them to that point,” Ferrell explained. Ferrell suspects some of these farm data disputes could land in the courts. He doesn’t know of any cases so far, but he has heard about potential expert witnesses preparing reports on the value of data. If growers aren’t fully aware of the potential risks in data disclosure, neither are they aware of the full opportunities, according to Tyler Mark at the University of Kentucky. 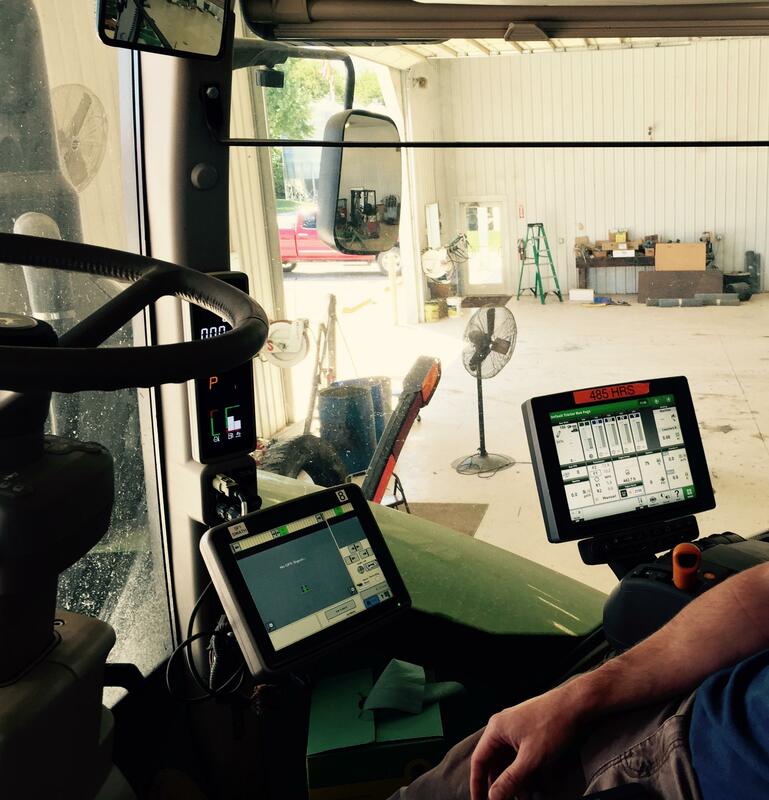 He thinks data could bring the “next revolution” in agriculture. Mark, an assistant professor of production economics, is another collaborator on the ag data white paper. “If you look back at the agriculture sector we’ve had the ‘green revolution,’” Mark said, in reference to the great gains brought by hybridized crops, chemical fertilizers, and mechanized irrigation. Mark and his colleagues argue that the next great leap will come with data, and that’s why it’s critical to get over the hurdles of sharing information. Industry experts like Ferrell, Griffin, and Mark say the benefits of gathering and sharing data outweigh the risks. “In particular cases big data allows some farmers to level the playing field,” Griffin explained. Mega farms can afford technology to generate data for themselves. But with these new data communities, smaller farmers would also have access to sort of productive techniques the larger farms enjoy. Farmers like Nick Woodruff agree. Even though he’s still leery of having his data in the cloud, that hasn’t stopped Woodruff’s farm from embracing new technology like the new John Deere self-driving tractor. The precision tool has sensors that gather information from the moment it’s turned on. Woodruff said just like the rest of the economy, everything in agriculture is consolidating. Big farms are getting bigger and farmers are finding it more difficult to keep pace with all the new technology. “If you aren’t moving forward you are falling behind,” he said.